We have recently submitted an update to the asset store, and below you will find a list of bug fixes, new features and improvements from version v3.40 which we lasted posted about here. This makes MegaFiers fully compatible with Unity 2018.1 and 2018.2, also rewritten the Wrap system so is now almost instantly generates the mapping data for wrapping the mesh instead of sometimes taking several seconds for complex meshes. MegaFiers now also builds correctly for the Hololens platform. And a small fix to the Create Mega Prefab system which could mean some prefabs could look wrong when added to a scene. Fixed the missing GUI call in the Point Cache Animator Inspector script that could cause Unity to crash. Fixed the missing GUI call in the Morph Animator Inspector script that could cause Unity to crash. Added option to Point Cache modifier to ignore first frame in playback, since some mdd files seem to save a pose frame as frame 0. Fixed bug in MegaHose and MegaHoseNew which could cause Hose mesh to update every frame. Some changes for latest Unity 2018.2 release. Complete rewrite of the MegaWrap mapping system, now takes less than a second for complex meshes as opposed to an hour in some cases. MegaFiers now works with the Hololens platform. Fixed a bug where some modifiers would look wrong after being added into a scene from a prefab. Fixed an issue in Unity 2017.2 that stopped the spline knots from being moved. 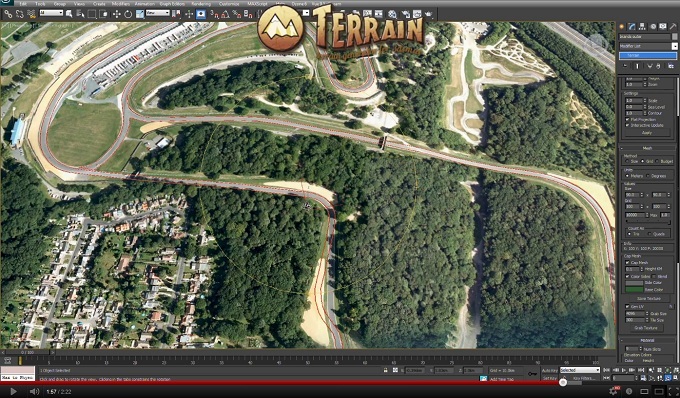 We have just updated the Terrain Plugin to work with the 2019 version of 3DS Max. If you visit the store page and enter the email used for the purchase you can get the latest version now. The demo version download also includes a demo version for 2019. We have recently submitted an update to the asset store, and below you will find a list of bug fixes, new features and improvements from version v3.34 which we lasted posted about here. This makes MegaFiers fully compatible with Unity 2017.2 and 2017.3, we have improved the OBJ Cache system and made it easier to import sequences. The Undo feature for working with splines has also been updated and improved to make editing splines nicer, and few other small fixes and improvements. Added inverse option to Volume Selection modifier to invert the selection. 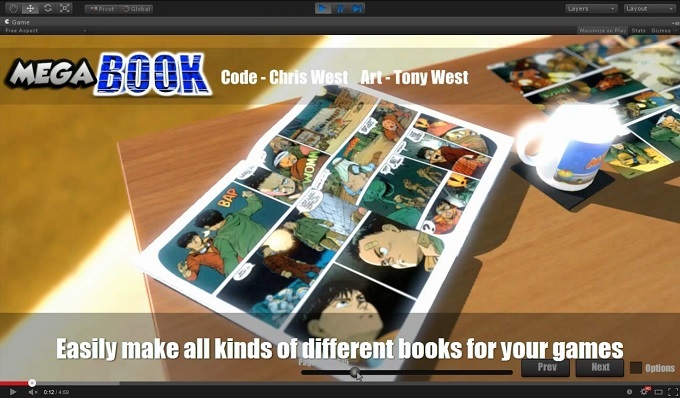 Added inverse option to the Multi volume selection modifier to invert the selection. Small optimisation to the volume selection modifiers. MegaCache OBJ seq import now works if the file names are just numbers. SVG importer updated to handle SVG files with ‘ ‘ separators as well as ‘,’. Added an Align option to Bez Patch object which will automatically position non corner control points to be aligned with the edges. Added Init Lattice context menu option to reset the Lattice points on a bez patch object. Added Align context menu option to Bez Patch object to align non corner control points. The Undo for MegaShapes now recognises adding and deleting of knots as well other the other options that change the spline such as Autocurve, scale etc. Fixed bug in Make Prefab where if a mesh was deformed when prefab was made it would be double deformed when the prefab was added to a scene. Removed an object from the demo scene with an invalid vertex that would stop the demo scene building on Mobile platforms. Changed file sequence importers to work without need for split character or format number, so now works correctly. Updated OBJ file importer to be able to handle negative indices. Changed OBJ material importer so you wont get an error if Material texture map fields are empty in the OBJ file. MegaCache made fully Unity 2017 compatible. Stopped MegaCache OBJ animated system from animating in edit mode. Fixed a problem with importing materials. Changed various importers to work around the Monobehaviour bug for StringReader making importing of files with Unix line endings very very slow. OBJ Material importer will now create Standard Shader materials instead of Legacy shaders. Added an error message when trying to import an OBJ file which contains faces with more than 4 sides, the OBJ importer only supports quads and tris. Improved the material importer so will use names in mtllib instead of expecting same filenames as obj files. Option added to force calculation of normals on import, this will override any normals in the OBJ files. OBJ files which contain no normals will now have normals calculated on import. Material importer now removes any ‘:’ found in the material names, ‘:’ can not be used in asset names in Unity. Material importer now defaults alpha value to 1 instead of 0 is alpha component missing, this stops meshes from being invisible after import. Fixed bug where mesh would not display if multiple materials were found in the OBJ sequence but load materials is not selected. MegaCache is fully 5.4 compatible. Added option to update mesh collider for Object Cache. 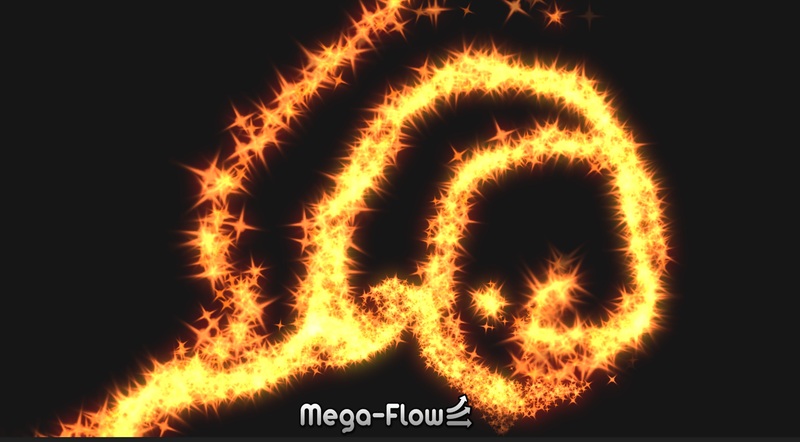 There is a new version of MegaFlow in the Asset Store, and since we last posted here about MegaFlow (v1.09) we have made dozens of improvements, bug fixes and added new features and improvements to make MegaFlow more powerful and easier to use. 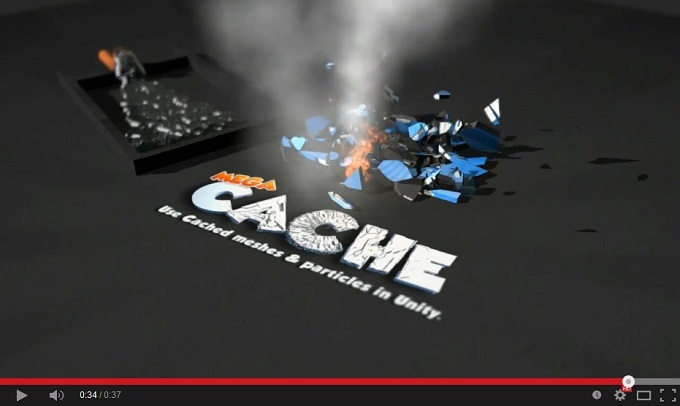 We have added support for Maya .pda particle cache files. Also the version of MegaShapes included with MegaFlow has seen many improvements to make it easier to edit and control your splines when authoring your own flows inside Unity. MegaFlow as also been made compatible with the latest release if Unity 2017. Please check the list below for the full list of changes to MegaFlow since version 1.09. When importing FLW, FGA or FXD sequences you no longer need to specify a split character or decformat. MegaFlow made fully Unity 2017 compatible. Fixed a bug where splines were being deleted if the ‘Add’ option was used when Loading a spl file. Updated MegaUitls.cs so if MegaFlow and MegaFiers used together there wont be missing methods errors. Changed FGA importer so it works with Blender FGA files that use floats instead of ints for grid dimensions. Fixed a problem with the Position handles when editing splines. Splines now default to Free Handle mode for editing. MegaFlow is fully 5.6 compatible. Added new improved spline smoothing, you can now choose between old and new smoothing modes in the Shape Inspector. New method will produce a perfectly smooth spline through all the control points. Added option to auto smooth the spline when you drag a knot, this will recalc the knot control points if you have changed any. Rewritten the spline editing bit, making it easier to select and move spline knots and handles. Move gizmos are now only shown for the currently selected knot. To edit a spline knot you just need to click the green sphere for the point you want to edit, that will then select that point. Option to freeze y movement when editing spline points, useful if using the free move handle type. No need to click and drag mid point gizmos to add a new point you can now just click the circle to add a new knot. Move handles now point along the spline. Added extra circle gizmo at end of open spline for easier creation of splines by easily allowing addition of knot on the end. Add Undo system for spline editing, you can now undo any changes made to a splines knots by clicking the Undo Edit Spline button. Added option to set the max Undos that can be stored. Fixed bug that caused splines to get corrupted if you tried to use the Spline animation builder on a spline with an imported animation. Added the missing SetHandles method to the MegaShapes API. Fixed errors when building for a Windows App platforms. Removed error in SVG importer when using a platform that does not support Regex expressions. MegaShapes lite changes applied to MegaFlow. The Green Handle Gizmo will now scale with the gameobject transform correctly. Fixed bug which stopped MegaFlow working correctly when flow data had been optimized. Added a check for empty velocity data in a flow frame, stopping an exception error. Added a warning in the console when trying to import FXD data that contains no velocity data. Fixed FXD parser for when there are different grid dimensions for velocity, smoke and grid fields. Beta of optimized 2D flows, if Z Grid is 1 then the system will use an optimized grid interpolation and z flow component will be 0. Fixed a bug for Unity 5.x users where the CreateFlow component would give an error due to the component not getting an Awake call. Added an interpolate option to the particle controllers so you can smoothly move from one flow frame to another. Fixed particles not flowing correctly on platforms with no threading support. Fixed MegaShapeLightMapWindow problem when doing an app build. You can now build lightmap data for MegaShape standard meshes. Changed OSM importer to use ulong for ids instead of int so can now handle complex OSM files. Fixed Shape labels being displayed if behind the camera. Added a beta OSM data importer. Click the Assets/Import OSM option. Added FindNearestPointXZ and FindNearestPointXZWorld methods to MegaShape API. Fixed exception if trying to build a mesh with a shape with no splines. Fixed exception if trying to interpolate along a shape with no splines. Fixed exception if trying to interpolate a spline with no knots. Autocurve fixed so the last knots handles on an open spline are correct. Fixed some potential errors in the constant speed interpolation. Smooth value is now a slider and shows results in realtime for easier use. Added a StartVal to the Create flow inspector which will be used to initialize the flow grid so you can easily set a start flow state. Fixed bug in the MegaFlow Rigid Body component that stopped it working. Added a MegaFlow controlled Rigidbody to the example scene. Added option to export flow frames back out to FGA files for use by other engines. Fixed bug which caused the smoke gun objects from being shown after a while. Added option to Smoke Gun to set range of start rotation of objects. Flow Effect now has color gradient option to change the color of the object depending on the speed range set. Added option to Flow Effect to align objects with the flow direction or the object movement direction, useful for arrows objects to show flow direction etc. 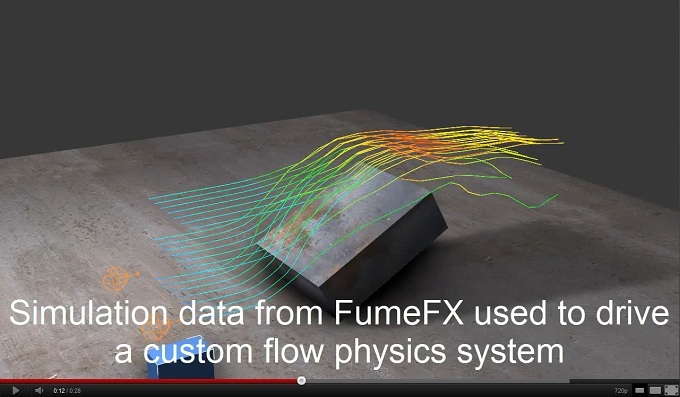 Added missing Mass value to the Flow Effect inspector. Update the SmokeGun script with more options and to make it easier to use. Added a SmokeGun object to the demo scene. Made changes for latest Unity 5 beta to fix any import warnings. Fixed exception when adding a new curve to a shape. Added option to Spline Tube Mesh to flip normals for inside tubes. Added option to Spline Box Mesh to flip normals for inside box tubes. Added option to Spline Ribbon Mesh to flip normals. Imported SXL splines will now no longer change values to centre the spline. Imported SVG splines will now no longer change values to centre the spline. Added Centre Shape button to Shapes Inspector to allow you move the pivot to the centre of all the points. Added new InterpCurve3D method which will return the postion, twist and also rotation quaternion for a point on a spline. Autocurve now does the first and last handles on open splines. Added ‘Update on Drag’ option to MegaShape inspector, if checked spline meshes will update as you drag, off then they will update when dragging stops. Fixed inspector for spline animations so buttons aren’t hidden. We have made quite a few improvements and bug fixes to our MegaFiers asset since version 3.25, below you will see a complete list of what new but amongst the changes are big improvements to the spline system included in MegaFiers making it easier to use and getting better results with a new auto smoothing system. We have also made MegaFiers fully compatible with Unity 5.6 and Unity 2017. Changed animation system to stop animated modifiers from updating in edit mode when not playing. Took out the check to only update modified objects if selected which was causing unexpected effects and objects not updating when dependencies were changed. MegaFiers made Unity 2017 compatible. Added new options to the BezPatch system to allow for better control over the animation system. Size value now works for FFD handles. Gizmo col alpha will effect FFD handles. Stopped all MegaModify objects in the scene being updated when editing another. Fixed FFD handles not changing mesh while dragging. Added experimental Hit Deform modifier for deformations when your object hits something. Fixed problem when building for Windows App platform with the OBJ Exporter. MegaShapes is fully 5.6 compatible. Mega Copy Object now works correctly for deformed meshes so that the new mesh is not predeformed. World Path Deform animation option works in Distance mode as well as percent mode. Path Deform animation option works in Distance mode as well as percent mode. Animation loop modes added to Path Deform and World Path deform, so you can Loop, Clamp, PingPong the animation if you want. Fixed an issue with the Bezier Attractor where the points array was not being initialised causing an exception. A new update for MegaShapes is now available, in this update we have re written the spline editing code to make it much niser and easier to use, we have removed the clutter of gizmos so now only the point you are editing will have a move gizmo displayed. 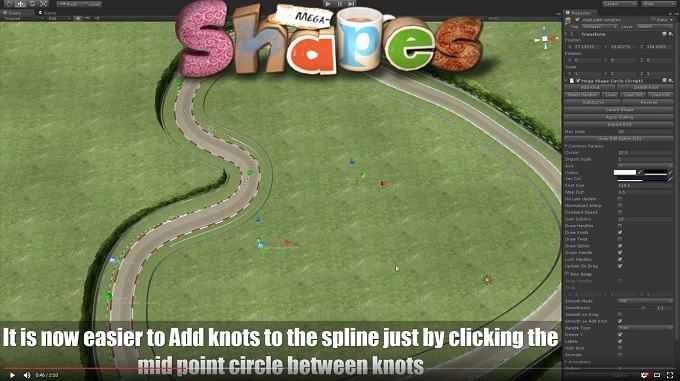 We have also made it easier to add points to your spline by simply clicking the mid point circle a new knot will be added and on open splines you just need to click the circle gizmo past the end of the spline to add further knots to your spline. Another new feature is a new smoothing method, this new system will always generate the smoothest spline through all your control points, and we added the option to automatically smooth as you drag a control point or add knots to the spline. We have also added a custom undo system to the spline editing make it very simple to back track over any changes you make to the spline, you now just need to click the Undo button in the inspector. 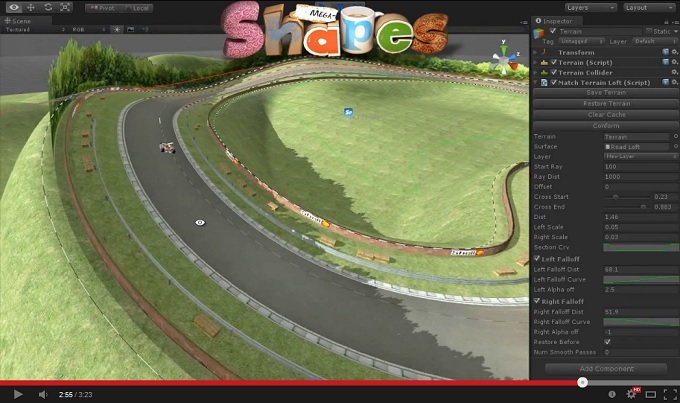 And finally MegaShapes is fully Unity 5.6 compatible. Fixed negative dist value in terrain carve component causing an exception. Lofts etc will auto update if a spline knot is deleted now. Lofts etc will auto update if a spline is reversed now. Added option to Walk Loft Smooth to use a raycast, useful if your loft is conformed to the ground or otherwise moved from the loft spline. MegaFiers has been updated again, this brings numerous changes, some bug fixes and a couple of new features. Firstly we fixed a small bug in the multi threaded morphing system which meant some vertices might not be moved correctly and you might have noticed a flickering on your moprhing object, this is now fixed. We also fixed the Lattice handles not updating meshes on the FFD warp objects. We also changed the Mega Copy Object option in the GameObject menu so it will now copy objects and keep their prefab info intact. Another change is the LateUpdate option has been replaced with an UpdateMode so you can now choose from Update, LateUpdate or OnRender. This was added to make MegaFiers work nicely along side other assets that may do they mesh updates in the OnRender method such as Text Mesh Pro. And finally we had a request to add an OBJ file exporter for deforming objects, so there is now an option in the GameObject menu to export the selected object to an OBJ file, or you can add the MegaOBJExport component to your deforming object and then select a key that will export the mesh, if you select ‘Sequence’ then you can set the frame rate to capture and as long as you hold down the export key a sequence of OBJ files will be exported. You can use this to bake complex animations to an OBJ sequence which you can then use to make a Point Cache file in a 3d package or import the sequence using the version of MegaCache that is included in MegaFiers. Added MegaOBJExport component so you can export a deforming mesh to an OBJ File or a sequence of OBJ Files. Added new item to GameObject Menu to allow you to directly export any mesh object to an OBJ file. Added a Scale modifier, making it easier to work with meshes that need scaling first. Added a new ‘Mega Duplicate Object New’ option to the GameObject menu, this will duplicate an object in the scene and preserve any prefabs and still update the meshes correctly for MegaFiers. FFD Warps can now be found in the same component section as the other warps instead of a different warp heading. Fixed issue on Unity 5.4 that dragging FFD Warp handles was not updating any object bound to that warp. Added UpdateMode to Modify Object, you can now choose between Update, LateUpdate or OnRender, this will change when in the render pipeline the deformations are added, Update is fine for most cases but sometimes you may need the other options, use OnRender with TextMeshPro objects for example or other procedural objects. Removed LateUpdate option from Mega Modify Object. Small optimisation to the Bend modifier. Fixed a bug in the multi-threaded Morph where some vertices might not be moved. Fixed the morph example in the demo scene not working and added more example morph channels. We have done numerous updates to MegaShapes over the last couple of months bringing some small bug fixes and a couple of new features. We have made MegaShapes fully Unity 5.5 compatible, also added a new Hose system that works better for connecting moving and rotating objects. We fixed the collisions in the rope system so that the layer selection works correctly, optimized the Lathe mesh builder and improved the normal calculation system, and many more little bug fixes and improvements. This video shows a car being controlled by a spline but still being free to go over obstacles etc. 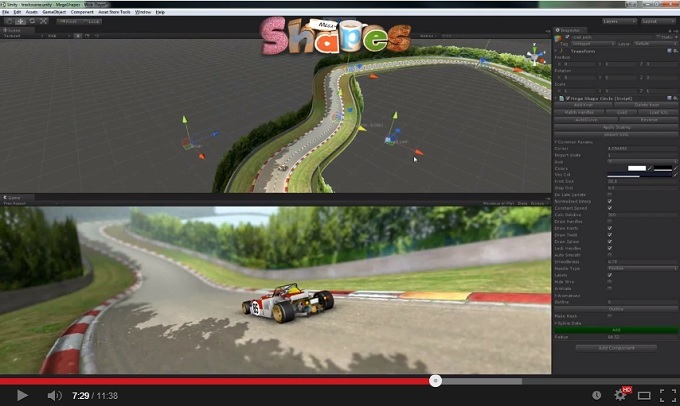 MegaShapes fully Unity 5.5 compatible. Layer field for the Rope collision field now shows all the layers correctly. Fixed bug with rope collisions not using the selected layer value correctly. Moved the New Hose system source file from the editor folder to the correct folder. You may need to delete the MegaHoseNew.cs file in the editor folder after an update. Added new Hose Attach system that uses the new hose system. Added a new version of the hose system that works correctly when end nodes are transformed or moved. Use ‘Hose New’ instead of ‘Hose’. Optimized the Lathe mesh builder. Improved the Lathe Normal calculation system so it works correctly for all cases. Fixed the mesh array size errors in the Lathe system when reducing the vertex count. Editing of splines is now disabled if an Alt key is down, stops accidental editing of splines while changing the scene view. 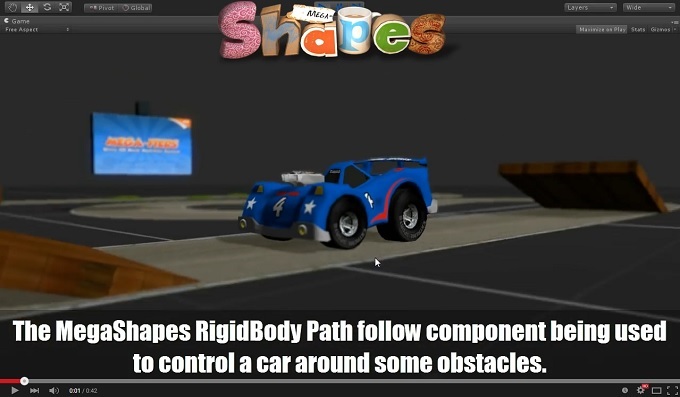 Added simple demo scene showing the RBody following a path component. Fixed error with Spline Fill mesh when being used as a collider with zero thickness. Fixed main demo scene where one of the lofts had its rules disabled causing an exception. Fixed a problem in Unity 5.x where zero length tris would cause an error and stop the collider being built. Fixed exception in inspector if you happen to create a spline with no knots in it. Added option to turn of the autosmooth when a new knot is added to the spline. Fixed a small bug in the Conform modifier which caused odd results when the mesh was rotated and using Local Down. Made changes to make compatible with upcoming Unity 5.5 release. Fixes for errors when building for Windows App platform. Fixed a bug in the Conform modifier so now detects if the Axis value is changed and so will work correctly. Added new options to the conform modifier to allow you to use the down axis of the object, so can conform on to objects from different directions, useful for conforming to say a sphere. Fixed the mesh being deleted if you removed the Modify Object component. Added two helper options to the context menu for the modify object component alowing you easily remove all MegaFier components from your object and either leave the deformed state or retore the mesh to its original state. Improved the material importer for MegaCache so will use names in mtllib instead of expecting same filenames as obj files. Fix for Wrap system on non skinned targets not being in the correct place. We have just submitted a small update to the AssetStore and our web store. This brings a few bug fixes such as a missing Copy Object method when using the Windows App target platform, and also MegaCache missing a method on platforms that do not support multi cores. We also added the requested Morph weight option for progressive morphs, and finally did some work on the Wrap system which fixed a problem with wrap prefabs on skinned objects not work working when added back into the scene and we have also greatly sped up the wrap system to between 2 and 4 times faster. This also adds an option to use the Unity BakeMesh system for faster calculation of skinned mesh vertices which again is a lot faster but note using that option will generate GC, if you turn it off it will be a little slower but no GC will happen, hopefully Unity will fix the BakeMesh so it will reuse a mesh instead of allocating one each time in the future. Fixed bug in the wrap system when using new BakedMesh option. Greatly sped up the MegaWrap system, 2 to 4 times faster. Added option to MegaWrap to use Unity BakeMesh for faster calculation of skinned vertices, note using the Bake option is a lot faster but will generate some GC. Fix for MegaCache missing a method when used on a platform that does not support multi threading. Fixed MegaCopyObject not present on Window App platforms. Fixed error in SVG code on Windows App platforms. Changes to the Progressive Morph Weight option so works as expected now. Helper script MegaShapeRBodyPath.cs moved from Test Scene folder to MegaShapes folder to stop duplication if MegaFiers and MegaShapes are used together in a project. Added weight option to Morph channels to allow adjustment of each channels contribution to the morph, useful for progressive morphs. Fixed a problem with Wrapped object prefabs when they were wrapped to a skinned target causing errors and not working when added back to a scene. We have just updated the Terrain Plugin to work with the 2017 version of 3DS Max. If you visit the store page and enter the email used for the purchase you can get the latest version now. The demo version download also includes a demo version for 2017. 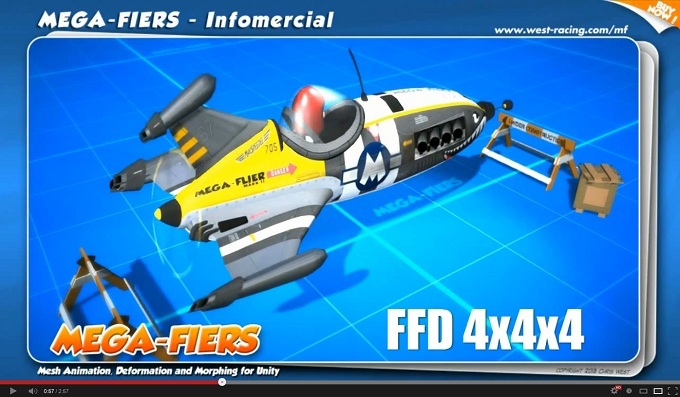 We have updated the MegaFiers system with a few new features and some bug fixes, we added 3 new Warps namely the FFD modifiers, we also fixed a bug in the Max Morph exporter in Max 2015 and 16 if you were using Progressive morphs, we have also fix a few bugs in the Make Prefab system so there should be no problems any more and also in the Copy Object system. We also added Unity Blendshape support to the wrap system so if your wrap object had Blendshapes they will still work now. And a few other fixes as well. Added beta FFD2x2x2 Warp Modifier. Added beta FFD3x3x3 Warp Modifier. Added beta FFD4x4x4 Warp Modifier. Fixed an issue with the 2015/16 3ds max exporter crashing with Progressive morph targets. Fixed a bug in the wrap system when a mesh is being copied causing an exception. Fixed an issue in the Make Prefab system if a ModifyObject was attached to an object with no mesh data. Fixed an issue in the Make Prefab system where meshes could be swapped depending on order of skinned and normal meshes in the children. Fixed the above also for Copy Object. MegaWrap system now copies Unity BlendShape data to preserve any blendshapes that may be attached to a wrapped item. MegaWrapRef system now copies Unity BlendShape data to preserve any blendshapes that may be attached to a wrapped item. Fixed mesh instead of sharedmesh being used in part of the copy object, so no more leaked mesh errors in edit mode when copying. Added a check in Create Prefab system for when a MegaWrap component is attached to a gameobject with no meshfilter which broke the copy system. 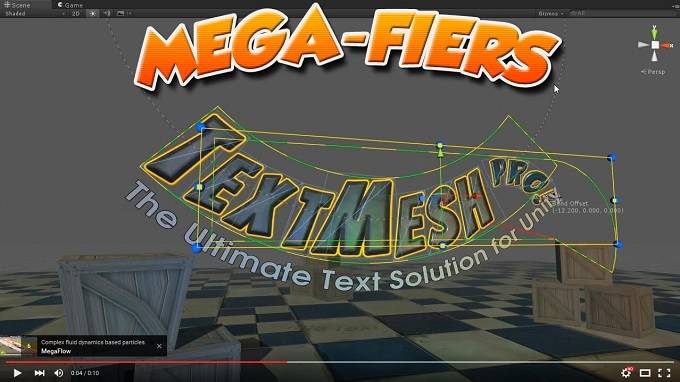 Update video showing a few different modifiers being used to deform Text Mesh Pro text, click the image to play the video. Updated Mesh copy functions so Unity Blendshape data is preserved. Stopped the mesh leak error when remapping the wrap mesh to object in the edit mode. There is a new version of MegaFiers in the AssetStore and on our webstore, since the last update post here. 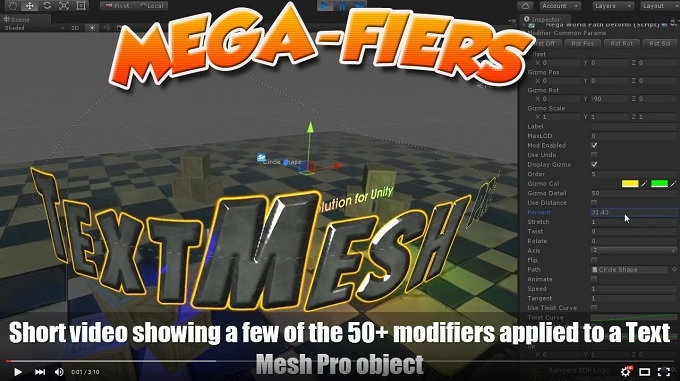 This update brings a major change to the internal workings of MegaFiers improving how it manages meshes and their data, this finally stops the false error from appearing when you first add a modifier to an object and more importantly it allows MegaFiers to work correctly with dynamic meshes such as those from assets like Text Mesh Pro. If you do want to use MegaFiers with an asset that is procedurally generated or likely to change vertex counts then just check the Dynamic Mesh check box in the Modify Object inspector and the system will take care of any changes made to the mesh. Note that with Text Mesh Pro sometimes the deformation may not show on the mesh when Play Mode is exited, changing any value in the inspector though will update the view and the mesh to what it should be. We also improved the MegaWrap system to make mapping a lot faster and also offer a cancel button for the mapping process so you can more easily tweak the values, we also added the option to use Mega Normal calculations on Wrap meshes so as to preserve smoothing groups. We also made MegaFiers fully 5.3 compatible. Please note due to the large changes to the internals of MegaFiers in this update please backup your project before updating the asset. Please make a backup before updating to this version as a lot of internals have been changed. Removed a lot of dead code and commented out sections. Changed the way meshes are copied and cached to make initial setup quicker, use less memory and stops the false error that would appear when a modifier is first added to a mesh. Mesh changes mean system can work with assets like Text Mesh Pro which update their meshes at Start time. Re did Mega Wrap mapping so now uses a cancel progress bar, so you can stop the process and also see how long it will take. Greatly sped up the Wrap mapping process. More performance increase to come to the wrap system in future updates. Added beta option to MegaWrap to use the MegaNormal recalculate option to preserve smoothing groups. Added beta option to MegaWrapRef to use the MegaNormal recalculate option to preserve smoothing groups. We have done numerous updates to MegaShapes over the last couple of months bringing some small bug fixes as well as new features such as all the Clone layers now work with the Conform option so you can easily build fences, walls etc that lay nicely on your ground, you can also now generate lightmap data for the basic MegaShape meshing options. We have also improved the OSM importer to allow you to select which layers to import and we also added a new demo scene to show how MegaShape splines can be used to control Rigid Body objects, in this case a car driving around a scene but still allowed to go over jumps etc. Fixed exception bug in the spline notify system that could appear when loft layers which do not use cross sections are used. Changes for Unity 5.1, removal of obsolete items etc. Fixed CrossSection lines not showing for Complex layer type. There is a new version of MegaFiers in the AssetStore and on our webstore, since the last update post here we have added a few features to the spline system and fixed a few small bugs. The Point Cache system importer has been improved as has the OBJ importer for morphs. And the Wrap system has seen some fixes and can now properly be saved to Prefabs and multi object prefabs can also be made correctly now. Added MegaCopyObject.DuplicateObject() method to allow you to copy Mega objects from script. Added a check to the Wrap system for skinned meshes with no bones being used as targets, system will now work in such cases. Changed the PC2 file importer to allow for files that do not contain all the samples indicated by the header. Improved Move RigidBody along spline system example script MegaShapeRBodyPathNew, note it is an example script for you to base your own on. Added a break force option to RigidBody spline follow. Fixed a bug in the Load Targets option when using OBJ files with the morpher. Added more options to the Move Rigidbody along a spline script. Added option to the Walk Rope example scripts to check object is within the bounds of the bridge object. Enable Recalc Bounds on any rope bridge to use. Removed the unused function LoadTexture which was causing a compile error when building for webplayer. Added a warning in the Wrap system if you are trying to wrap to an object with no mesh. Just a quick post to highlight some of our assets for Unity from the videos we have posted just in case we have any new visitors that may have missed them. A little promo video for MegaFiers that shows a few selected features of the system. Just added an update to MegaShapes v2.08, since the last update posted here we have made improvements to the Terrain carving, fixed some bugs and made a bunch of general improvements. We also added example scripts showing how to draw splines and lofts at runtime using the mouse or touch, also added an example script showing how to control rigid bodies with splines and we have added support for importing OSM (Open Street Map) files to splines. Below you can see a couple of videos showing the new draw spline.loft system as well as the system to control Rigid bodies. 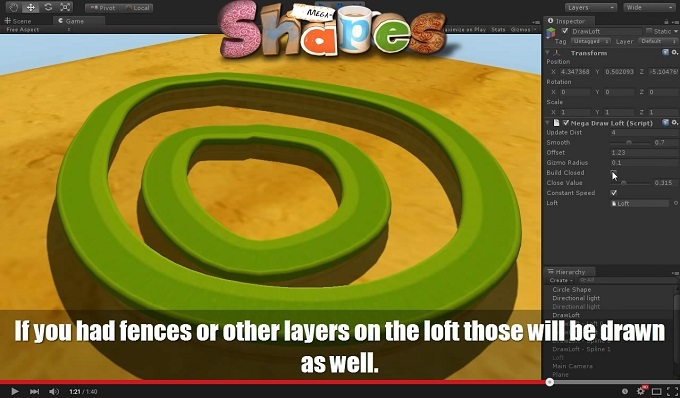 This video shows the new script included with MegaShapes that allows for splines or lofts to be drawn at by the user at runtime. Added example script showing how to move a RigidBody object along a spline with forces. Changed Clone Spline simple so position of layer is not linked to spline position, no need to duplicate the spline if used multiple times. Changed Clone Spline so position of layer is not linked to spline position, no need to duplicate the spline if used multiple times. Changed Clone Spline Rules so position of layer is not linked to spline position, no need to duplicate the spline if used multiple times. Remove the SetActive warning from Draw Loft Component. Added in the Mega Mesh Page component. Added a new Scatter system (MegaLoftScatter) to allow you to scatter complete objects onto lofts. Tweaks to the Draw loft and Draw Spline components. Added a Draw Spline example script to make splines by drawing with the mouse at runtime. Added a Draw Loft example script to make new lofts by drawing with the mouse at runtime. Added a demo scene showing the draw spline system. Added draw loft example to the first tutorial scene. Fixed Terrain Carve gizmo being offset from the loft. 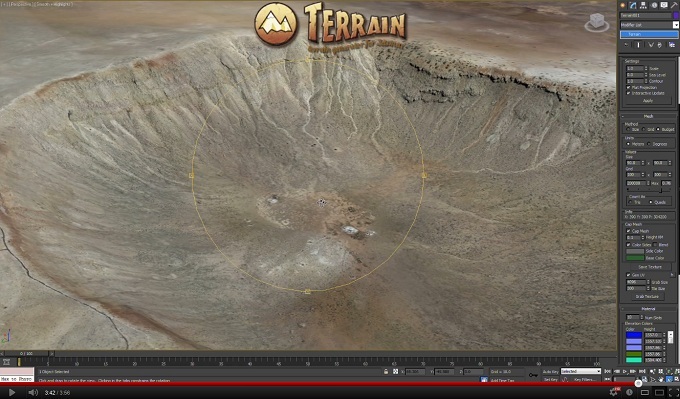 Fixed exception when first adding a terrain object to the terrain carve system. Made the default curves for the terrain carves correct for left and right. Terrain carve now works with open lofts. Terrain carve outline splines now use same interpolation settings as the loft spline for better results. Terrain carve Conform button will not appear in the inspector until the Save Heights button has been clicked to save confusion. Fixed bug in the WalkLoft GetLocalPoint method where it was not using the passed dist value. Fixed bug in the WalkLoftSmooth GetLocalPoint method where it was not using the passed dist value. Added GetPoint method to WalkLoft to get any point on the loft, as opposed to the GetLocalPoint which is relative to the current walk loft position. Added GetPoint method to WalkLoftSmooth to get any point on the loft, as opposed to the GetLocalPoint which is relative to the current walk loft smooth position. Fixed import warnings for the latest Unity 5 beta. 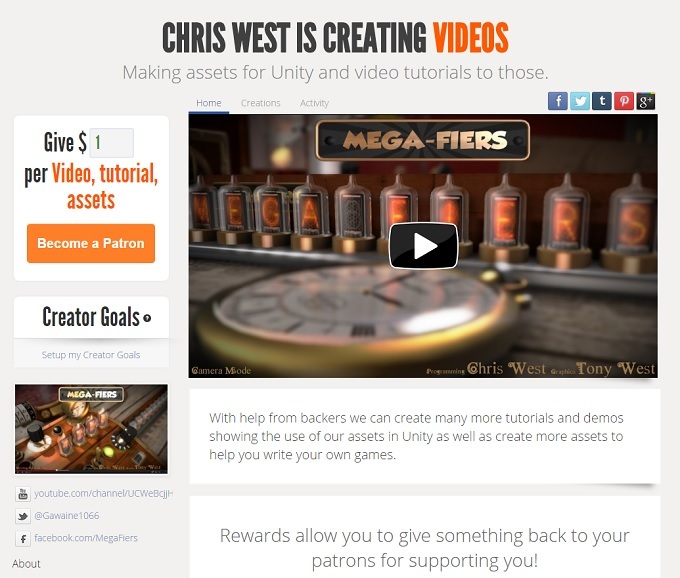 We have set up a Patreon page in case anyone would like to help support the creation of new tutorial videos for our Unity assets and also help add new features to existing assets as well as the creation on new systems to help you make your games. We have submitted the latest update to MegaCache to the Asset Store and our webstore, this adds a beta of a new Particle Playback system which is different from the existing Particle cache system in that it can be used to playback one shot or discreet particle effects such as explosions, the previous particle cache system is used to play back continuous particle simulations such as smoke. Also the system is fully compatible with Unity 5. Added option to particle import to remove particles alive in last frame from import. Improved particle importer to remove particles that only have one frame of data. Added a new Particle Playback component for direct particle playback as opposed to the emitter version, means one shot effects like explosions etc can be used as opposed to constant effects like smoke. Added playback component for legacy particles as well. 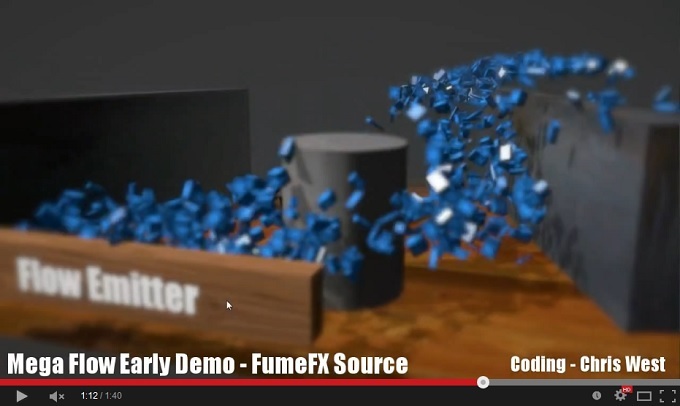 Smoke in demo scene working correctly. Added a beta of a new Point Cloud import and playback system. Added a beta exporter for Blender to export Blender particle systems to MegaCache prt format. Fixed bug with particle importers wanting .txt extension instead of .prt generated by the Max exporter. Demo scene was saved using a file as a data source which would not work without the cache file. Demo scene now uses an ‘Image’ data source. Added option to update mesh collider for Object Cache Ref. Added a runtime folder option for OBJ Cache files, cache files for standalone builds need to be copied the data folder for the build after the Unity build. Just a quick post to say that all our Assets are fully Unity 5 compatible and will import into your Unity 5 projects with warnings or need for the Unity auto update tool etc. We have just updated MegaFiers again in the Assetstore and on our webstore, this brings a lot of changes since the last update news was posted here, below you will see a list of the changes, improvements and bug fixes since version 2.82. Optimized the Attractor Shape modifier some more. Attractor shape modifier now works with multiple splines. Added a version of the Displace modifier that can use RenderTextures. Added option to World Path deform to use a distance value or percent value. Added option to Path deform to use a distance value or percent value. Tweaks to the Draw Spline components. The Clone Spline layer now works with the spline twist values. Added option to MegaCache Obj to update the mesh collider if one is present. Fixed a bug in the Copy Object method where normals might not be copied correctly depending on settings. Fixed mouse offset issue in dynamic ripple modifier if using a box collider which has a non zero center value. Added new modifier, Conform Modifier that supports multiple targets. Added option to OBJ Cache inspector for Name Split character. Fixed image base OBJ Seq mesh not appearing when project loaded until it is animated. Fixed final warning for importing asset into Unity 5.x project. Fixed bug meaning bilinear option in Dynamic ripple could not be unchecked. Added a limit option to the Attractor modifier to limit range of the effect and help improve performance. Repulse mode in Attractor modifier now works correctly. 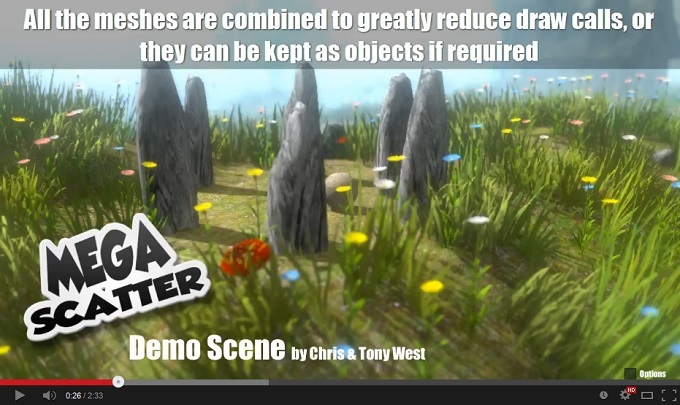 Added simple demo scene for the Attractor modifier. MegaFiers now imports into Unity 5.x with no changes required. We have just released version 1.97 of MegaShapes to the Asset Store and our webstore. This brings some bug fixes as well as new features such as being able to flip the normals on meshes generated from Splines so you can have inside tubes easily. The Clone Spline layer now can use the spline twist values and we added some extra methods to the Walk Loft scripts to allow you to easily get points on the loft. Added a method GetLocalPoint(float dist, float crossa) to WalkLoft script to allow you to easily get a point on the loft in the local space which can be used for steering controls etc. Added a method GetLocalPoint(float dist, float crossa) to WalkLoftSmooth script to allow you to easily get a point on the loft in the local space which can be used for steering controls etc. Fixed a bug in the MegaShapeFollow script when using the option to rotate objects to align to the spline. Added new InterpCurve3D method which will return the position, twist and also rotation quaternion for a point on a spline. The nice people over at HutonGames sent us a copy of PlayMaker so we could look at adding some actions to allow PlayMaker users to more easily use the MegaFiers system, so over the last week or so we have been adding Actions for the more commonly used aspects of the system and will be releasing a PlayMaker Actions asset soon. To start with the include actions will allow you to control most of the Modifiers in MegaFiers along with the Warps. We will be adding further actions to the system probably as they are requested by PlayMaker users, so if you are a user of PlayMaker and MegaFiers then please do let us know what is needed. 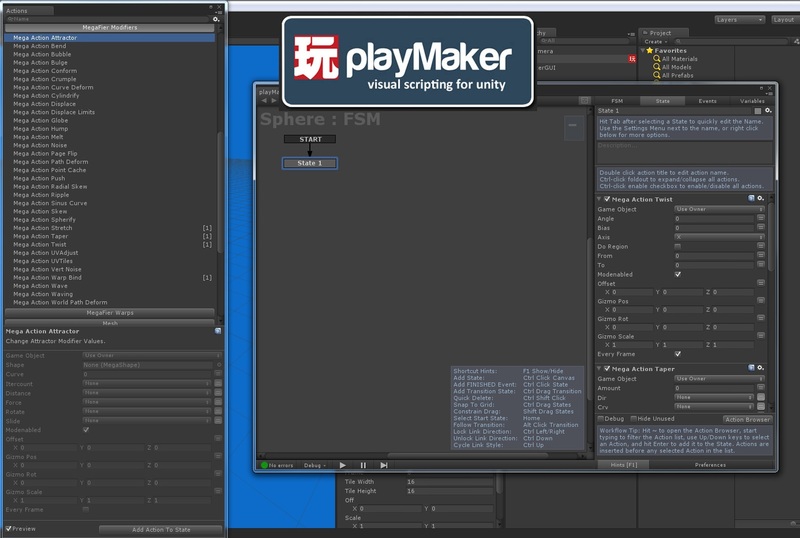 And we will also soon be adding PlayMaker actions for our other Mega Assets such as Shapes, Book, Scatter, Flow, Cache and Wires. Currently the actions included allow you to control the following Modifiers. And also the following Warps. You can get the PlayMaker actions now at our WebStore for $10 per seat. The clever chaps at VirtualWare have released a video of their amazing Virtual Aquarium that they have just installed in the Yurabi Restaurant in Barcelona. 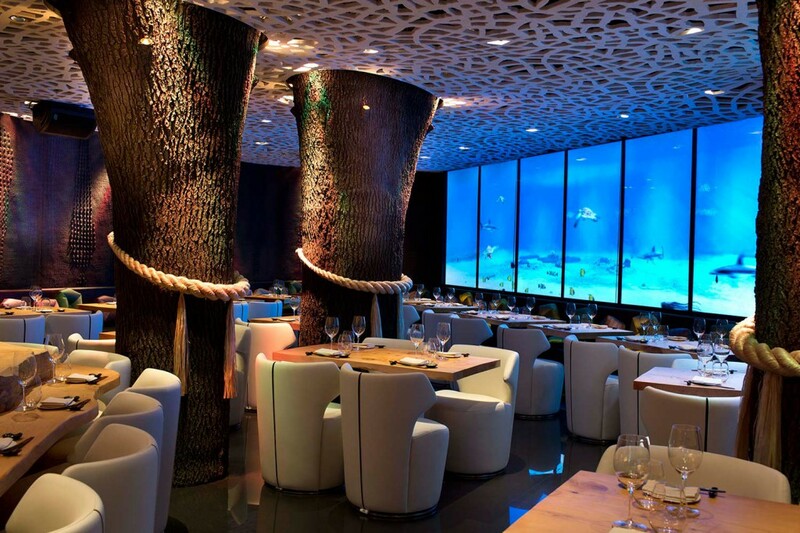 They used MegaFiers to animate all the fish and creatures in the tank. 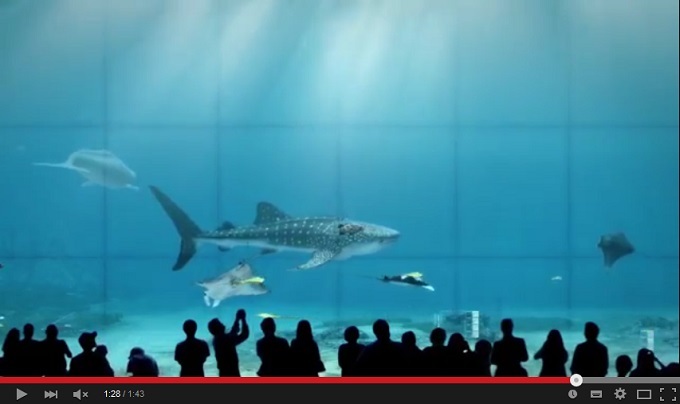 I think a trip to Barcelona is called for Click the image above to play the video to see the Aquariums in their full glory. MegaCache is available for purchase on our webstore, and will soon be in the Unity AssetStore, you can find out more about the system by cheking the MegaCache section of the website by using the mneu bar on the left. We are getting close to the release of MegaCache which is our new system for Unity that allows you to import complex mesh animations and particle systems and play them back inside Unity. All the systems in MegaCache make use of multi threading for amazingly fast performance and also feature memory optimizations to allow complex files to be used with minimum inpact of resources. The video is a little teaser of the system playing back a Fluids dynamic simulation a RayFire Fracturing object animation and a Particle Flow system exported from Max and imported into the Unity Shuriken system by MegaCache. Update: We have submitted MegaCache to the Unity Assetstore for approval, or if you can’t wait it is available now on our website. Since the first release of MegaFlow we have done numerous updates to fix any issues and add numerous new features to the system with more to come. The main new feature that was added is support for moving flow sources which opens up some cool uses for the system, we have also improved the Texture 3D support so now vector feilds can be used by GPU based particle systems such as TC Particle, and we have improved the Vector field authoring system. Below is a complete list of the changes since first release and there is also a video showing the work flow for the new moving source system. Added beta of the new moving source system. Added a simple demo scene showing the moving source in use. Added a Shuriken particle controller that uses moving sources. Added a legacy particle controller that uses moving sources. Added method to MegaFlowFrame API to get flow velocity as a world space position. Makes it easier to use for external scripts. 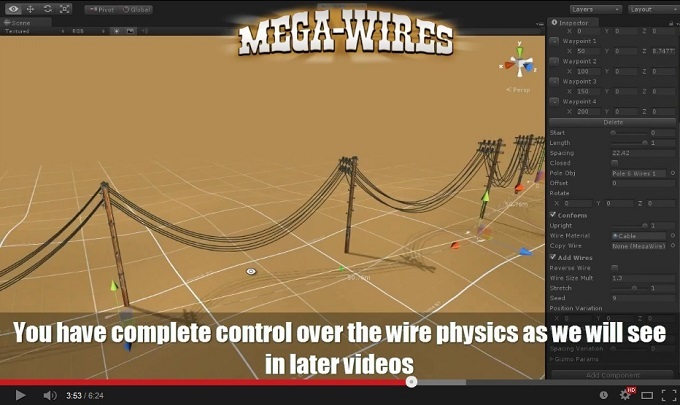 Changes made so users of MegaWires can use flow sources as wind sources for the wire physics. Improved the inspector layout for the Create Flow system. Added helper component MegaFlowSample which has two methods to allow you to get easily get the velocity from a flow field. Updated the docs page for the MegaFlow source to show new options. Updated the docs page for the Create Flow system to show the new options and inspector layout. Further Optimizations to the particle controllers. Changed the Texture3D create mode to fit the TCParticle layout. Include setting for splines now respected in create flow. You can now resample the current frame to new grid dimensions, handy for testing smaller grids for better memory use. Added option to add modifiers to the flow creation, so you can add any object with a collider and use that to adjust the flow. Fixed an issue with missing preview flows not being saved in the scene. Each frame can now have an offset value, useful if using multiple frames of different sizes. Added option to the inspector normalize the flow frame data. Added a preview option for the Create Flow system, so you can quickly see the current flow without having to send it to the flow source. Fixed issue in Texture3D builder with negative values. Added API section to MegaFlow docs, GetGridVelWorld, SetFrame, SetMatrix, GetCol methods. If the MegaFlow Particle component is attached to a particle system you dont need to select a particle system to use, the system will use the object. If the MegaFlow Legacy Particle component is attached to a particle system you dont need to select a particle system to use, the system will use the object. Added beta option to inspector to save a Texture3D to the project for the current frame, can be used by GPU shader or particle systems such a TC Particles. Fixed an exception if particle system was trying to use a flow source with no frame data. Fixed an exception if rigid body controller was trying to use a flow source with no frame data. Fixed an exception if effect controller was trying to use a flow source with no frame data. Fixed a mismatch between cell and vector colors when showing magnitudes. Added flow arrows to the Create From Spline gizmos to show the flow direction and force for that spline. Added option to ring display to adjust alpha value. Splines remain visible when Create Flow object selected. Option to have Create flow gizmo always on. Added gradient color option to create flow from splines system. Just a quick post to say the early adopter pricing of $50 for the MegaFlow system will be ending soon, so don’t miss out. This video is a first look at a new system coming to MegaFlow soon, it allows you to have moving MegaFlow sources in a scene that follow the path of a moving object and allow that object to interact with particles as it moves through them. The first part of the video shows a scene with leaves and smoke and a car driving through them, as expected no interaction happens between the car and the particles. With the Moving source system turned on the car will now react nicely with the leaves and smoke, dragging the particles along in the MegaFlow vector field that is attached to the car. The Vector Field was generated using FumeFX in 3DS Max and imported into MegaFlow. Have you ever wanted to simulate a wind tunnel in your game, or have leaves of snow blow through your village flowing naturally around buildings, speeding up down alley ways or settling slowly in the lee of an obstacle, Lava flowing down a volcano side or Waterfalls cascading over rocks, Or a car stirring up leaves as it drives along a road in Autumn, vortices for your plane wings, perhaps an object floating along fast moving water, tornadoes, or even simulate gravity around objects in space, if so then MegaFlow can help. 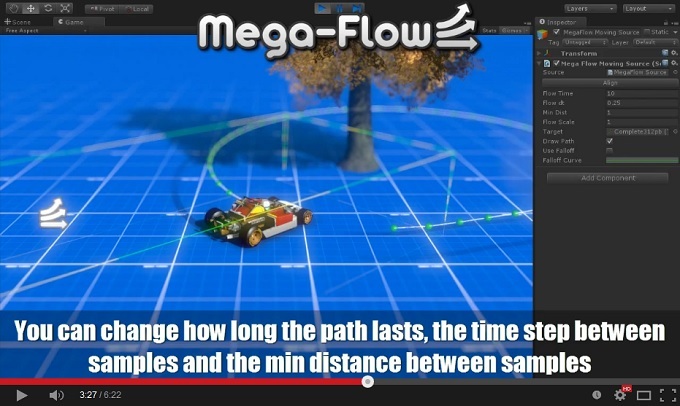 MegaFlow is a set of systems that allow you to use Vector Fields to control the movement of objects or particle systems in Unity. Vector fields are a 2D or 3D grids of values that describe the direction and magnitude of velocities for that point in space. 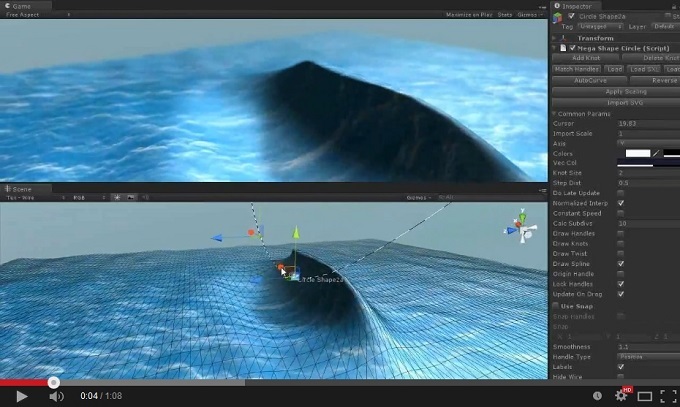 The Vector Field can be generated by systems such as Maya Fluids, FumeFX, Krakatoa, etc. MegaFlow can import the files generated by those systems in the form of .FXD or .FXA files, it also has an exporter for Maya that will export any Maya fluid simulation to the MegaFlow .FLW format. You can then import a single frame or multiple frames into the MegaFlow system in Unity and then use that to control the movement of particles from either the Shuriken or Legacy particle system, or control movement of Rigid Bodies or just general objects. Don’t worry though if you don’t have access to any Fluid Simulation software as MegaFlow also comes with a system that allows you to author your own Vector Fields inside Unity using multiple splines to define flow directions and forces. The movement of objects interacting with the Vector Fields is via a simple physics simulation which has parameters that allow you to control the overall force the field applies and the mass of the objects that are interacting with it, this means you can adjust the look and feel of the flow from either a very tight following of the flow to a subtle influencing only of objects that move through the field. You can change the force the field exerts or reverse the flow direction. All the values can be adjusted at runtime via script of the Unity animation system if required.The physics code used is optimized for performance and makes use of multi threading on any system that has multiple cores for super fast performance even with 10′s of thousands of particles being moved. If a system such as FumeFX or Maya fluids has been used to create the Vector Fields then that would allow you to place obstacles into the flow, if the flow is then used to control a Particle system you can get even more performance back by disabling the collision system in the Particle system, since the Vector Field will now handle moving the particles around objects in the way, this can get you quite a saving in CPU time in complex scenes. You can off course still use the collision system of the particles or rigid bodies alongside the flow system if you wish. The Vector Field source can have any number of Vector Fields loaded so you can do animation of flows if required, or just easily swap the flow field being used to change the look and flow of your scene. You can ask the system to show you the flow through the system of objects via the visualization options, or display the flow as either vector lines or colored cells. 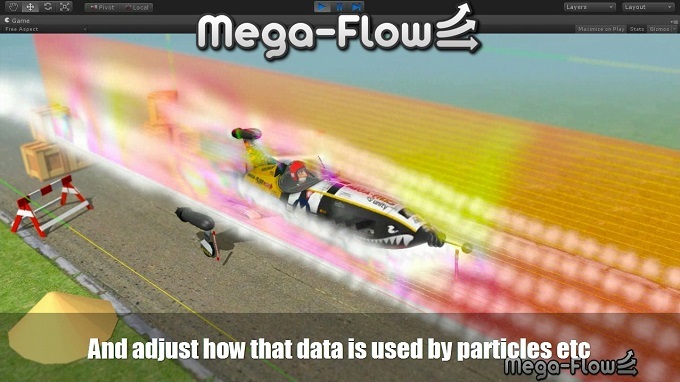 Included in MegaFlow are various components to help you use the Vector Fields in your projects. There are components to control the Unity particle systems as well as a component you can attach to any rigid body object that will then allow that object to be influenced by the Vector Field. There is also an example Smoke Gun script that will inject large numbers of objects into a scene so you can see how they flow. To find out more about the system please check the MegaFlow section on the menu on the left. Below are some videos showing the MegaFlow system being used in a couple of scenarios, the first uses a Maya Fluid simulation to simulate the airflow around objects in a scene, the second shows the in Unity creation of Vector Fields from splines and that then being used to control a particle system. The third shows a Vector Field being created inside Unity using splines to define flows. We have added some new features and fixed a couple of bugs since the first release, listed below are the changes, many more coming. 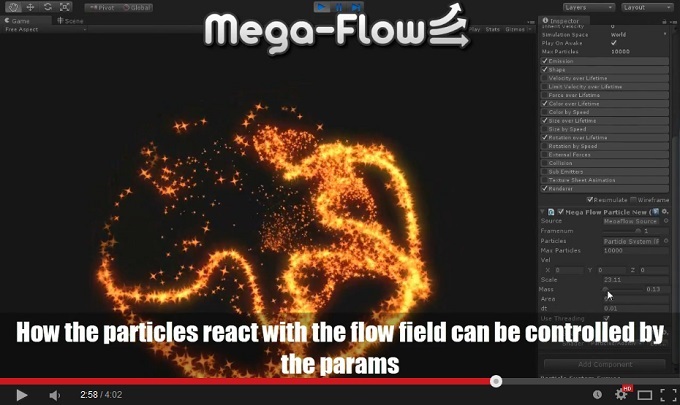 MegaFlow allows you to use the power of fluid simulation software such as RealFlow, FumeFX, Maya and others to generate Vector Field simulations that can then be used to control the flow and behaviour of particles, rigid bodies or any other game object in your projects. MegaFlow supports industry file formats such as FXD and FGA as well as having a custom exporter for Maya for an xml FLW format. 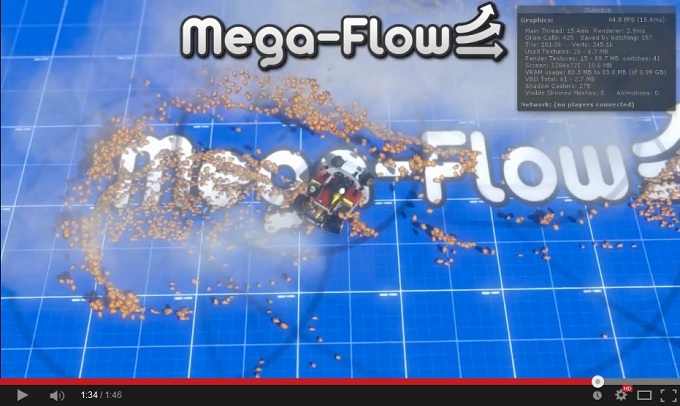 The simulation code in MegaFlow is multi-threaded so runs extremely fast on many thousands of particles. Just submitted v1.94 of MegaShapes to the Asset Store and to our own store page. This brings some improvements to the spline editing and a series of bug fixes and some changes for the upcoming release of Unity 5.0. Fixed exception in Terrain Carve if no Loft Layer selected. Fixed an exception bug when duplicating layers. Small fix for Unity 4.x where loft layers were not updating when a spline was edited. Fixed Path Follow script so it works correctly with spline twist. Fixed Path Follow script so offset and extra rotation work correctly in all cases. Added ‘Update on Drag’ option to MegaShape inspector, if checked spline meshes or lofts will update as you drag, off then they will update when dragging stops, for complex lofts this makes it easier to edit splines. Just uploaded an update for MegaFiers, since the last update post this brings some fixes to the path follow script and a helper script for moving rigid bodies along splines. Also Made some changes for the up coming Unity 5.0 release and have added the new Bezier Attractor modifier beta which is handy for doing breaking waves. Added option to the dynamic ripple modifier to use a readable greyscale texture as obstructions for the ripples. New modifier added, Bezier Attractor. MegaWrap now works with Create Mega Prefab, Beta feature, works with tested objects on Unity 3.5. Path Follow script updated to use spline twist values. Path Follow script updated to have offset and rotation values. Added example script MegaShapeRBodyPath.cs to show how to connect an RBody to a spline, the rbody can then be moved along the spline using a force. Added option of a Frame Delay for Point Cache to improve syncing with Unity animations. Added a new method to MegaModifyObject MeshChanged(Mesh newmesh) which you can call if the original mesh has been changed, ie dynamic text objects. Fixed slowdown when using the morph sliders on Unity 4.x. Fixed error when demo scene scripts not imported. Added option to export MegaShapes to SVG files. Added option to choose easing mode for twist values, either Linear or Sine at the moment. Added id values to the spline knots. Removed some Debug messages that were left in for Maya morph import. We have made available a new version of MegaShapes that fixes some issues with the new Multi Material Complex loft layer and also reduces the vertex count in the loft. Below is a list of all the updates since the last MegaShapes update post. Fixed the issues with using Multi Mat Complex layers as base layers for other layers such as clones, cross alpha values were not being calculated correctly. Fixed Multi Mat Complex layer where too many vertices and polygons were being created, such lofts will be more optimized now. Fixed issue where Multi Mat Complex layer would not give correct up values. Fixed exception when using other loft layers with Multi Mat layer when cross alpha values were out of range. Fixed exception when using other loft layers with Multi Mat Complex layer when cross alpha values were out of range. Walk Loft Smooth script now works with the Multi Material Complex loft layer. Added option to export MegaShape splines to SVG files. Fixed exception error in Multi Mat Complex layer. Conform now works in the Multi Mat Complex layer. Fixed bug in Multi Mat Later where last vertex wasn’t being added if cross distance value was large. We have been adding more example content maker scripts to Megabook, the latest one allows you to use multiple mesh objects to build your page content, so you just layout each pages content using whatever text system and meshes you like with any number of materials, then using the helper script you select the parent object for each page layout and the book builder will do the rest automatically combining all the meshes and materials it finds under the parent and adding it to the page mesh so that the content will bend and turn with the page. So you can now layout your text in anyway you like using any text system you wish and add in images. The text in the example above was generated using Text Mesh Pro which is an excellent Signed Distance Field text system for Unity with a ton of rendering options, and as it uses SDF the text will remain crisp and sharp no matter how closely you zoom in, also Text Mesh Pro allows for easy coloring of text and a load of other special effects so making it the perfect partner to MegaBook for creating your content. You can though as mentioned above use any system that builds a mesh.